Very few "true black metal" projects can be taken seriously with their "ideology" and aesthetics. However, there still are "true" BM releases that really carry the seeds of insanity, such as Mayhem's "De Mysteriis...", or "Blood Must Be Shed" by Zyklon-B. 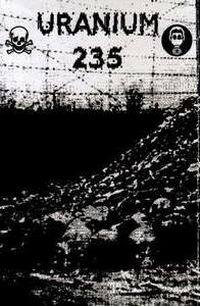 This very obscure demo cassette may be not as impressive as "Blood Must Be Shed", but Uranium 235 and Zyklon-B certainly have a lot in common, both musically and aesthetically (not to mention they both started in 1995). The only member of Uranium 235 also has a much more prolific industrial black metal project called "Godkiller", which I haven't checked out yet. Uranium 235 is also a title of a NY-based industrial rock/metal band which has nothing to do with the black metal Uranium 235 from Monaco.